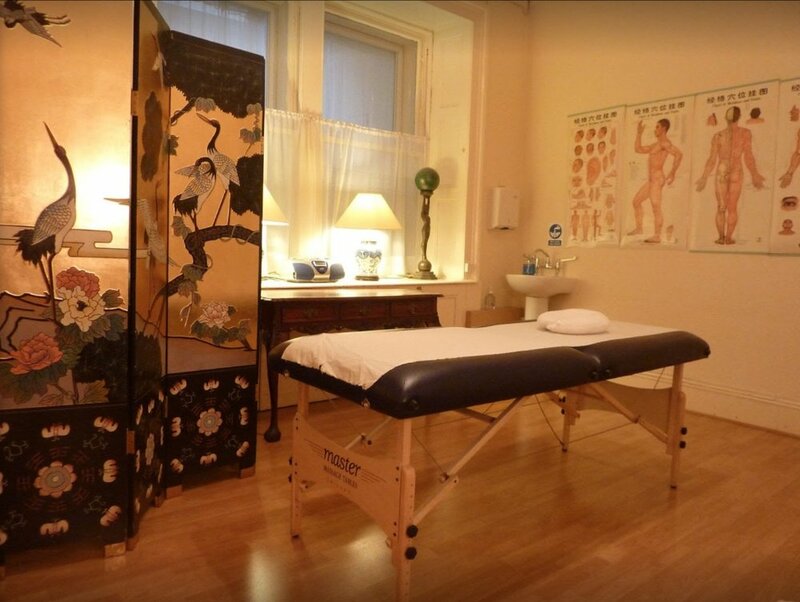 Ming Chen Clinics is a group of Traditional Chinese Medicine (TCM) Clinics, each staffed by fully qualified, experienced and registered Practitioners who have trained in TCM, acupuncture and Western Medicine in China and the UK. At our Clinics, we are dedicated to maintaining a balance of body and mind: a holistic approach to the individual. We offer all our clients access to a team of specialists, brought together with the express purpose of providing a substantial experience and knowledge base, who work closely with local GPs, physiotherapists, chiropractors and counsellors. Ming Chen Clinics has a wide client base; we offer advice and support on all aspects of health-related issues. Do you suffer from chronic pain such as headaches, musculoskeletal pain or long term illness? Our new lower cost chronic pain clinics every Wednesday could be the help you need! The British Pain Society has reported that acupuncture can be helpful in the management of chronic headaches, migraine and muscle pain syndromes. We are delighted to welcome Cathy Waddell Clinical Massage Therapist and Bodyworker to our clinic. 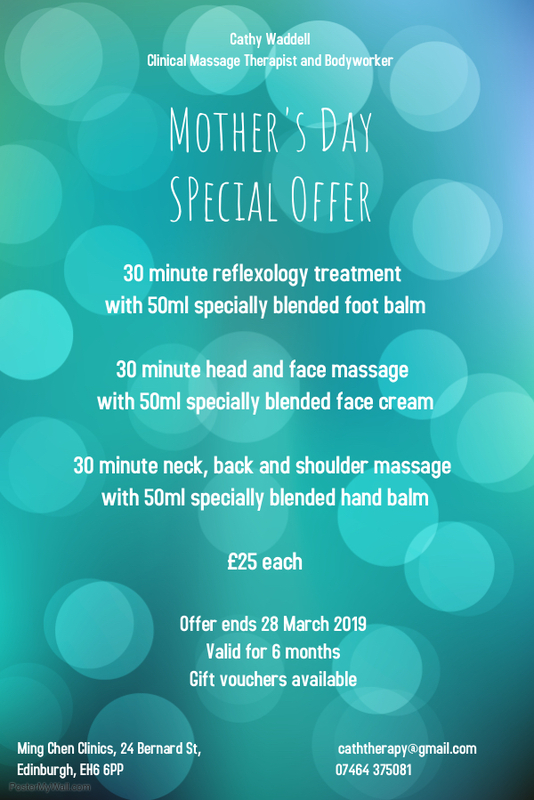 Cathy will be offering 25% off all her treatments until 28th February check her out on our practitioners page. National Obesity Awareness Week starts on the second Monday of January each year and runs for the full week.This year’s event begins on the 14th through to the 20th. Join us now to celebrate the National Obesity Awareness Week. Make your New Year's resolution, let us all get healthier in 2019. In Traditional Chinese Medicine(TCM), acupuncture, herbs, healthy diet, excercise such as Tai-chi, and meditation are often used to aid weight loss. TCM sees and treats your body,mind and emotions as a whole system and it views weight problems as the symptoms of a greater health problem. TCM deals with the underlying body condition that may have led to the excess weight. Weight problems are usually caused by energy, or Qi (pronounced chee)deficiency and an imbalance in the function of the organs.The typical symptoms of the Qi deficiency and imbalance include feeling bloated, sluggish, irregular bowel movements, low energy, sugar craving or food intolerance and weight gain. By restoring the body’s balance, we will have an abundant supply of qi flowing freely through the body, and our internal organs and systems can function properly to keep us healthy. An improved metabolism will process food properly. Acupuncture has been proven to be very effective in reducing excess weight and maintaining it. By restoring your inner balance, regulating the endocrine function, reducing appetite, increasing defaecation and increasing overall energy and vitality. Chinese herbal tea for weight loss has also been widely used and proven to be effective. Research suggests that the polyphenols from oolong tea, green tea, black tea or pu-erh tea help to increase weight loss and fat burn, even in the presence of a high sugar diet. One type of these polyphenols, called catechins, may help to prevent your metabolism from slowing down as you lose weight. There are also some Chinese herbs which can help to increase metabolism, and to suppress the appetite to aid weight loss. We look forward to celebrating World Acupuncture Day on Thursday 15th November 2018! This week is International Stress Awareness Week! Stress affects us all in one way or another, and at Chinese Medicine and Healthcare we hope to be able to help you deal with this problem on an everyday basis. Stress can be simply defined as an emotional or environmental stimulant that evokes what is known as the “fight or flight” response in the body. It may lead to mental and physical illnesses such as depression, insomnia, digestive disorders, ulcers, muscular pain, impotence and menstrual dysfunction among many other debilitating states. This has an effect on the balance of the metabolism and hormonal systems, altering, for example, the release of cortisal adrenaline and neurotransmitters such as endorphins. A certain amount of stress is actually beneficial in order to stimulate our creative energies - some people even thrive on it! Others, however, do not, and too much stress over too long a period of time is invariably detrimental to our health. Chinese medicine acknowledges that each of us reacts to stress in different ways, according to our constitution. Some of us find it affects our sleep whilst others may become irritable or have a propensity to high blood pressure. We tailor our therapies to the individual, making sure that you find the right way to relax and rebalance. This October is Breast Cancer Awareness Month. Our hearts were saddened by the news of the tragic death of the courageous BBC presenter Rachael Bland last month; so many people were touched by her positive outlook on living a full life with cancer. Did you know some facts about Breast Cancer? One person is diagnosed every 10 minutes. Although the survival rate for Breast Cancer has increased over the years, we all know that physical treatment is only half the story. Cancer patients need extra support for their emotional well-being, especially in coping with anxiety, depression and their constant fear that the cancer will return. A Breast Cancer Care survey found 1 in 4 women (26%) found the end of treatment the hardest part of breast cancer and only 1 in 10 (10%) said they felt positive and ready to move on when they were discharged from hospital treatment. More than half (53%) struggled with anxiety at the end of treatment and nearly a third (31%) with depression. There are currently 850,000 people living with dementia in the UK and the numbers are rising rapidly with an estimate of over one million by 2025. Alzheimer's disease is the commonest type of dementia (affecting around 60% of those with dementia), followed by vascular dementia (20–25%). This September - World Alzheimer’s Month, if you are living with dementia or any of your family, or friends is in need of support with the condition we are here to share with you and anyone who is interested with latest research information on how Acupuncture and Traditional Chinese Herbal Remedies help improve the memory and cognitive functions of Dementia patients..
To celebrate the Year of the Dog, Ming Chen Clinic Edinburgh will run a series of special intercultural events introducing the Chinese tea ceremony. The Chinese tea culture has existed for thousands of years, with a large variety of different teas, each having specific benefits and many different tastes. In our ceremonies, we celebrate special occasions such as the New Lunar Year through green tea, a symbol of Spring. The tea ceremony demonstrates how to make Chinese tea as well as the traditional way of tasting and smelling it. We will also provide information about the cultural importance of Chinese tea. We will sometimes introduce Chinese watercolour painting at our tea ceremonies. Look out for dates of our tea ceremonies here or on our Twitter and Facebook pages.